PLEASE READ THESE TERMS AND CONDITIONS CAREFULLY BEFORE USING THIS WEBSITE. Access to Naples Pilates, Fitness & Therapeutics’s website (the “Website”) is provided only to supply general information to the public, employees and its customers. Your use of the Website is expressly conditioned on your acceptance of the following terms and conditions. By using the Website, you signify your assent to these terms and conditions. If you do not agree with any part of the following terms and conditions, you must not use the Website. 1. OWNERSHIP.Except for items in the public domain, the information and all other materials comprising the Website (collectively, the “Materials”), are wholly owned by (or licensed to) Naples Pilates, Fitness & Therapeutics and/or its content providers. The Website contains copyrighted material, trademarks, and other proprietary information. Naples Pilates, Fitness & Therapeutics owns a copyright in the selection, coordination and arrangement of the Website. Nothing contained on this Website should be construed as granting, by implication, estoppel, or otherwise, any license or right to use any of the Materials without the written permission of Naples Pilates, Fitness & Therapeutics or such other party that may own the Materials. 2. USE OF WEBSITE.Except for your non-commercial personal use, the Website may not, in whole or in part, be sold, reproduced, published or redistributed in any medium, directly or indirectly, for any commercial or non-commercial purpose. Unauthorized use of the Website and/or the Materials may violate applicable intellectual property laws or other laws. You must retain all copyright and trademark notices, including any other proprietary notices, contained in the materials. The use of such materials on any other website or in any environment of networked computers is prohibited. You are prohibited from posting or transmitting any unlawful, threatening, libelous, defamatory, obscene, pornographic or any material that could constitute or encourage conduct that would be considered a criminal offense, give rise to civil liability, or otherwise violate any law. 3. AGE AND RESPONSIBILITY.You represent that you are of sufficient legal age to use the Website and to create binding legal obligations for any liability you may incur as a result of the use of the Website. You understand that you are responsible for all uses of the Website. 5. NO WARRANTIES.THE WEBSITE AND THE CONTENT PROVIDED THEREON IS PROVIDED “AS IS”, AND NEITHER Naples Pilates, Fitness & Therapeutics NOR ANY OF ITS AFFILIATES, SUBSIDIARIES, BUSINESS UNITS, CONTENT PROVIDERS, LICENSORS, EMPLOYEES, AGENTS, OR THE LIKE MAKES ANY EXPRESS OR IMPLIED REPRESENTATIONS OR WARRANTIES REGARDING THE USABILITY, CONDITION OR OPERATION THEREOF. NO ORAL ADVICE OR WRITTEN INFORMATION GIVEN TO YOU BY Naples Pilates, Fitness & Therapeutics OR ANY OF ITS AFFILIATES, SUBSIDIARIES, BUSINESS UNITS, CONTENT PROVIDERS, AGENTS, OR THE LIKE SHALL CREATE ANY WARRANTY. NEITHER Naples Pilates, Fitness & Therapeutics NOR ANY OF ITS CONTENT PROVIDERS, AGENTS, OR THE LIKE WARRANTS THAT ACCESS TO, OR USE OF, THE WEBSITE WILL BE UNINTERRUPTED, VIRUS FREE, OR ERROR-FREE, OR THAT THE WEBSITE (INCLUDING, WITHOUT LIMITATION, ANY CONTENT ON THE WEBSITE) WILL MEET ANY PARTICULAR CRITERIA OF PERFORMANCE OR QUALITY. Naples Pilates, Fitness & Therapeutics, ON BEHALF OF ITSELF AND ALL OF ITS AFFILIATES, SUBSIDIARIES, BUSINESS UNITS, CONTENT PROVIDERS, AGENTS AND THE LIKE, HEREBY EXPRESSLY DISCLAIMS ANY AND ALL WARRANTIES AND/OR REPRESENTATIONS, WHETHER EXPRESS OR IMPLIED, ORAL OR WRITTEN, INCLUDING, WITHOUT LIMITATION, ANY AND ALL IMPLIED WARRANTIES OF MERCHANTABILITY, REASONABLE CARE, COMPATIBILITY, SECURITY, RELIABILITY, ACCURACY, AND/OR FITNESS FOR A PARTICULAR PURPOSE (WHETHER OR NOT Naples Pilates, Fitness & Therapeutics KNOWS, HAS REASON TO KNOW, HAS BEEN ADVISED, OR IS OTHERWISE IN FACT AWARE OF ANY SUCH PURPOSE), IN EACH INSTANCE IN RESPECT OF THE WEBSITE. FURTHERMORE, Naples Pilates, Fitness & Therapeutics, ON BEHALF OF ITSELF AND ALL OF ITS AFFILIATES, SUBSIDIARIES, BUSINESS UNITS, CONTENT PROVIDERS, AGENTS AND THE LIKE, HEREBY EXPRESSLY DISCLAIMS ANY AND ALL WARRANTIES OF TITLE AND/OR NON-INFRINGEMENT IN RESPECT OF THE WEBSITE. 6. LIMITATION OF LIABILITY.Naples Pilates, Fitness & Therapeutics and all of its affiliates, subsidiaries, business units, content providers, agents and the like, in each instance will not be liable for (a) any direct, indirect, incidental, consequential and/or special damages arising out of your use of, or inability to use, the Website, and you hereby waive any claims with respect thereto, whether based on contractual, tort or other grounds, even if Naples Pilates, Fitness & Therapeutics has been advised of the possibility of such damages, and/or (b) damages or injury caused by any failure of performance, error, omission, interruption, deletion, defect, delay in operation or transmission, computer virus, communication line failure, theft or destruction or unauthorized access to, alteration of, or use of any file, in each instance whether for breach of contract, tortious behavior, negligence, or under any other cause of action. For further clarity, in all events, Naples Pilates, Fitness & Therapeutics and all of its affiliates, subsidiaries, business units, content providers, agents and the like shall not be liable for the defamatory, offensive, or illegal conduct of other users of the Internet. Some jurisdictions do not allow implied warranties to be excluded or modified or liability to be limited, so not all of the above limitations may apply to you. The provisions of this Section 5 and Section 6 above represent a reasonable allocation of the risks under this Agreement. Naples Pilates, Fitness & Therapeutics’s willingness to allow you to use the Website reflects this allocation of risk and the limitations of liability specified herein. 7. INDEMNIFICATION.You agree to indemnify Naples Pilates, Fitness & Therapeutics and all of its affiliates, subsidiaries, business units, content providers, agents and the like, in each instance from and against any and all claims, suits, liabilities, expenses (including, without limitation, attorneys’ fees), and/or damages arising out of claims based upon use your use of the Website including, without limitation, any claim of libel, defamation, violation of legal rights of others (including rights of privacy or publicity), loss of service by other subscribers and/or infringement of intellectual property or other rights. 9. GOVERNING LAW.This Agreement and its performance shall be governed by the laws of the state of Florida, United States of America, without regard to its conflict of law provisions. You consent and submit to the exclusive jurisdiction of the state and federal courts located in Lee County, the state of Florida, United States of America, in all questions and controversies arising out of your use of this Website and this Agreement. 10. NO WAIVER.The failure of either party to insist upon or enforce strict performance by the other party of any provision of these terms and conditions shall not be construed as a waiver of any provision or right. Neither the course of conduct between you and Naples Pilates, Fitness & Therapeutics nor the trade practice shall modify any provision of these terms and conditions. 11. MODIFICATION.Naples Pilates, Fitness & Therapeutics may at any time modify these terms and conditions and your continued use of this Website will be conditioned upon the terms and conditions in force at the time of your use. 12. ADDITIONAL TERMS.Additional terms and conditions may apply to other portions of the Website, and you agree to abide by such other terms and conditions. 13. SEVERABILITY.These terms and conditions shall be deemed severable. In the event that any provision is determined to be unenforceable or invalid, such provision shall nonetheless be enforced to the fullest extent permitted by applicable law, and such determination shall not affect the validity and enforceability of any other remaining provisions. 14. INTELLECTUAL PROPERTY NOTICES.All contents of the Website are Copyright © 2016 Naples Pilates, Fitness & Therapeutics. 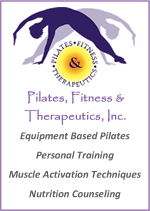 Naples Pilates, Fitness & Therapeutics is a trademark of Naples Pilates, Fitness & Therapeutics. All rights reserved. Product and company names mentioned in the Website are the trademarks of their respective owners. 15. ENTIRE AGREEMENT.These terms and conditions, together with those incorporated herein or referred to herein constitute the entire agreement between us relating to the subject matter hereof, and supersedes any prior understandings or agreements (whether oral or written) regarding the subject matter, and may not be amended or modified except in writing or by making such amendments or modifications available on this Website. Naples Pilates, Fitness & Therapeutics offers personalized fitness training in a private and safe environment while assisting you to reach your fitness and wellness goals.